"2569" by flikr user Jeremy Brooks used under CC license. Resized and cropped. 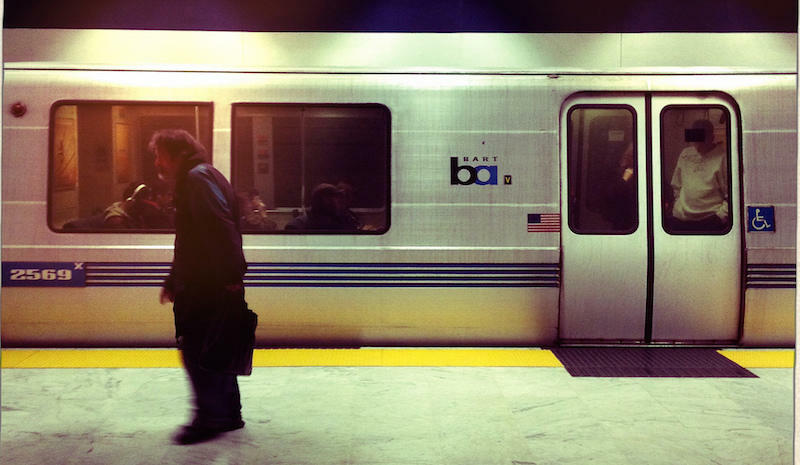 There’s been a 45 percent increase in mental health-related calls to BART police since 2011. When officers don’t know what to do, they call Armando Sandoval. As BART’s community outreach liaison, Sandoval spends a big chunk of his mornings walking around downtown San Francisco BART stations, waking up homeless people and asking how he can help them. I meet Sandoval while he’s conducting a sweep of Powell Street station one morning. Sandoval says safety is paramount. That includes safety for the homeless people his team of police officers are waking up. After police shot and killed Oscar Grant, an unarmed man, in 2011, an independent auditor suggested the agency make 127 different policy changes. Hiring a crisis intervention consultant like Sandoval was one of them. Many of the people he meets struggle with addiction, mental illness, or a combination of both. “With every level of contact here, we first go to safety, assess if the person is safe, just to make sure we know if they need medical or psychiatric attention,” Sandoval says. The team spots five sleeping homeless men, and then they split up. Sandoval stops by one homeless man he’s woken up many times before. He asks him how he’s doing. “Staying warm, staying out of the elements?” Sandoval asks. The man seems too sleepy to know how to respond. It’s now a little after 8am, and the officers say there were roughly 30 people sleeping in the corridors of the station just a few hours ago. That’s a normal number. “It’s well lit. It’s patrolled. It’s warm. It’s dry, you know?” Sandoval explains. Technically, BART has an ordinance that makes it’s illegal for people to sleep, sit, or lie down at Powell Street station. But Sandoval sees people doing exactly that every day on his job. There are the homeless veterans who are long overdue social services, the people who cling to bottles of hard liquor as they sleep, and the couples who cling to each other underneath a blanket. There are people suffering from mental illness. There are people who know they need help, and people who are in denial. I ask Enrique Alfonso, the regular Sandoval woke up, if he slept at the BART station last night. “Here? No. I try not to sleep here at all,” Alfonso says. But he says he does sleep here. Sometimes he’s so tired he just passes out. And however he got here, he isn’t angry Sandoval woke him up. “It's a transportation network that needs to be open every day for customers, and unfortunately sometimes it's seen as a refugee zone,” Alfonso says. But he’s not planning to go anywhere, either. Sandoval asks Alfonso if he’s had a chance to stop by St. Boniface, a Tenderloin church where homeless people can sleep at night. He also asks if he’s been in touch with Swords To Plowshares, a group that helps veterans. Alfonso tells Sandoval he has too many friends who live on the street to try to change. After his morning rounds, Sandoval follows up with people whom BART officers have put on involuntary psychiatric holds, and he takes calls from other officers who need advice on dealing with the mentally ill. He also connects with different social service agencies to talk about ways to help solve San Francisco’s homeless problem. “It's definitely a bigger battle than what law enforcement can come up with as a remedy,” he says. At Civic Center, the officers wake up another homeless man, Michael Kripal. He tells them it’s hard for him to access services without a cell phone. The officer tells him they’re passing out free cell phones in the Mission with cheap plans. Kripal already knows. “They call them ObamaPhones,” he says, as in phones that are cheap. “It’s too damn cold to be out there,” Kripal says. The man’s a veteran, and so is the officer. The officer uses that to connect. “You mean hurry up and wait?” Kripal replies. I ask him how he ended up sleeping in the Civic Center BART station. “I've been homeless pretty much since I've been out of prison a year-and-a-half ago,” Kripal says. He adds that there are resources to help veterans, but that’s not the issue. “I have some kind of chemical dependency, some addiction problems, so it's hard for me to make appointments sometimes,” Kripal says. He tells me he stays awake, until he can’t anymore. He sleeps where he can. When I talk to Kripal, Sandoval watches closely, measuring if Kripal is a person he can engage with. “I'm watching you interact and engage, so it's my measure. I always do that. If they're able to engage with an officer, there's an underlining of being able to work with them,” Sandoval explains. But just like the commuters, BART officers have to keep moving. We’re all in transit here, except for those who take refuge in the train station to lie still for a few hours to get some sleep, and the police officers who stop, for a few seconds, to ask why. This story originally aired in March of 2016.